PennsylvAsia: Taxi fights in the old news: Pittsburgh almost had 대리운전, too. Taxi fights in the old news: Pittsburgh almost had 대리운전, too. 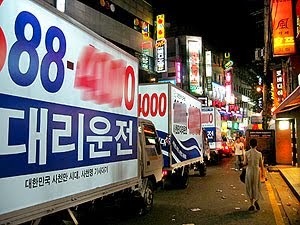 Advertisements for a designated driver company lined up in Gangnam, from Sisa Channel. BeMyDD (Be My Designated Driver) started operations in Pittsburgh this week after launching in three Ohio cities earlier this year, he said. "BeMyDD is a new twist on a transportation service which gives people an affordable alternative to the usual limo or taxi. The premise is that 'We drive YOUR car, so you don't have to,' " Mr. Simanovsky said. The company offers two services: A customer can reserve a driver ahead of time who will meet them at a location of their choice, chauffeur them around in their own car, wait for them and take them home, for $12.50 an hour. For those who are already out and in no condition to drive, the company will dispatch two drivers to take them and their car home. That costs $25 plus $2.95 a mile for the first 10 miles and $1.50 per mile thereafter. The company ran into problems when the Pittsburgh Utility Commission informed them that drivers needed Pennsylvania drivers' licenses to operate in the area. They don't doubt, however, that Be My DD will solve the problem and make its return to the area soon-hopefully within the next two weeks. The service is quite common in South Korea, a nation of heavy drinkers and mandatory after-hours functions. A Naver search turns up 206 companies and operators in Ulsan, a city of similar size and population to Allegheny County. The New York Times took a look at Korea's professional designated drivers in 2007. Their work has become such an essential part of life in Seoul and other major cities of South Korea that the national statistical office last year began monitoring the price of replacement driver services as an element in calculating the benchmark consumer price index. An estimated 100,000 replacement drivers handle 700,000 customers a day across the country, the number increasing by 30 percent on Fridays, according to the Korea Service Driver Society, a lobby for replacement drivers.